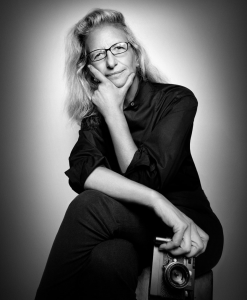 June 2013 saw one of the most exciting announcements ever come out of the Art Gallery of Nova Scotia: the donation of a huge cache of famed photographer Annie Leibovitz’s original photographs to our regional art museum. Included in the collection, which numbers over 2,000 prints, are some of Leibovitz’s most iconic images: John Lennon and Yoko Ono, taken just hours before he was killed; the naked and pregnant Demi Moore; Queen Elizabeth II; the Blues Brothers. It is reportedly worth $20 million. The buzz created by the deal went national and international. Clearly, the AGNS had lucked into a wonderful blast of philanthropy from the collection’s owners, the family of Al and the late Faye Mintz, who were looking for a smaller gallery as a home for a sure-to-be popular attraction. In 2013, AGNS CEO Ray Cronin called the photos “one of the most transformative additions to the collection” and stated that they would probably be exhibited in 2014. Since the initial news release, however, what should have been a great story has turned sour. 2014 came and went, as did 2015, and now almost half of 2016, and there is still no established date for the exhibition of Leibovitz’s pictures. In the meantime, Ray Cronin has been let go as CEO. Nobody seems to know what exactly is going on at the AGNS. This is where I make my disclosures. I have worked at the Dalhousie Art Gallery since 1986 as the Film Curator. I’ve also know other gallery administrators – Robin Metcalfe of St. Mary’s Art Gallery, for example, ran an independent curator’s group in Halifax in which I participated. And my late sister Bernadette was briefly on the board of the AGNS some years ago. In an interview with the CBC in the summer of 2015, newly-appointed interim CEO of the AGNS Lisa Bugden divulged few details of the Leibovitz situation. In October Bugden stated that they were hoping to launch an exhibit in 2017, but offered no guarantee. I briefly got to know Bugden during the last days of Film and Creative Industries Nova Scotia, where she competently guided that ship until it hit the rocks on April 9, 2015, when the McNeil government axed the Film Tax Credit and dissolved FCINS with absolutely no warning. How that culturally disastrous decision reflects on the AGNS situation might seem like drawing phantom lines from one cultural sector to another, but there are some similarities, chief among them the fact that there is a distinct lack of information and virtually no consultation involved with the sector or the public. What may have happened in the Leibovitz situation is in fact the reverse. The CCPERB was presumably asked to certify the collection for the AGNS. Apparently certification also guarantees a matching grant from the Department of Heritage for handling and processing the work. In the case of the Leibowitz photos, all 2000 of them, we’re talking about somewhere between two and twenty million dollars. Here’s where the glitch comes in. Because Leibovitz isn’t Canadian, the CCPERB turned the request down. The AGNS suddenly had a collection with no extra money or resources. A slam dunk suddenly turned into a disaster. And there is a larger question, one that may have ramifications for anyone bequesting non-Canadian material to any Gallery across the county: will anyone get a tax credit if the material isn’t Canadian? Will this produce a ‘bequest chill’ amongst major donors, just when thousands of well-off baby boomers across Canada might be considering donating their collections to Canadian galleries and museums? The whole issue is shrouded in mystery and murk. Apparently, there is no possibility of appeal. And while over-ruling an arms-length cultural board is not unheard of, it is also not terribly palatable to any sitting government that doesn’t want to be accused of political interference. The Leibovitz bequest mess almost certainly cost Ray Cronin his job. It has also besmirched the Art Gallery of Nova Scotia’s long-term reputation. As a public gallery, it owes Nova Scotians an explanation. After the Film Tax Credit debacle, it is just another piece of very bad news hanging in the air after a tough year in the cultural industries here. I have been wondering what has delayed the exhibition of this exciting collection. Just today, I read the AGNS announcement of the new season and was expecting to circle my calendar for the Liebovitz dates, but was dismayed to see they were not there!! Thank you for this explanation. If it is a federal political matter, I will address my questions appropriately.